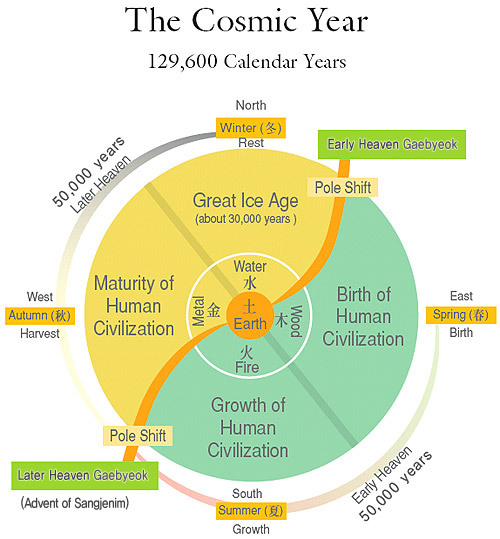 Ahn Un-san, His Holiness the Taesang Jongdosanim of Jeung San Do first drew the cosmic year diagram to contextualize the birth, growth, and maturation of human civilization. The cosmic year spans four cosmic seasons: spring and summer (the Early Heaven), and autumn and winter (the Later Heaven). During the cosmic year, humanity and its civilization arises in the cosmic spring, flourishes in the cosmic summer, and attains maturation in the cosmic autumn. The cosmic winter is a period of rest.